A Birchwood Group producer directs the event, and a professional moderator interacts with your presenter(s) to ensure that the program runs smoothly. Your host/stage manager co-presents and runs the technology throughout the entire meeting, partnered with an event co-ordination director, and backed up by our live tech support team. This archive library will be housed on your private Update On-the-Net, web communications portal with 24/7 on-demand viewing capability. Participants would simply register at your web communications portal, to obtain access and view the materials. Depending upon the program's timeline, these program elements can be made available for a number of years. If needed, secure private chat rooms can be enabled at specified times, for interactive discussion. This is a very low tech method for achieving communications on the Internet. 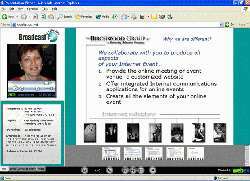 your audience will meet in a secure virtual meeting room, housing from 10-1000 participants.